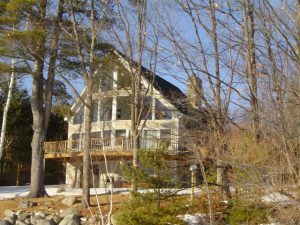 Ever since my college years, where I had spent many summer days on Lake Winnipesaukee in central New Hampshire, I thought about someday building a dream home on that lake. After years of toiling away as an electrical engineer at several high tech companies I finally got that chance in the late 1990s. The dotcom bubble occurred and I just happened to be at the right spot at the right time. Or should I say more precisely, I had positioned my education, work experience, and job selection such that I had the opportunity of benefiting from that event. My point, it wasn’t all luck, for those of you who really want to pursue your dreams. In my case, building a lake home was a dream that I pursued early on with career planning, hard work and dedication. And not surprisingly, the same skills that were actually needed in building my dream home. In the ensuing sections of this article, and in subsequent parts to this documentary, I describe all that was involved in building my dream home on Lake Winnipesaukee. From it, I hope you can learn something from it so that someday you too can build your dream home or realize you’re your personal dream. I wound up buying a small cottage on the shores of Lake Winnipesaukee in 1999. The lot was not large, only 0.4 acres. However, it had 100 feet of pristine waterfront and had a nice gentle grade from the back of it to the water’s edge. It was perfect lot for building my dream home. Due to the fact that I grew up as a kid helping my father build a few homes and home additions, and had done the same for myself with a couple of other homes I had owned as an adult, I had decided early on that I was going to act as my own general contractor on building my dream home. I knew acting as my own general contractor would also save me a bundle on the cost of building my dream home. I was also in the fortunate position that I didn’t need to rely on a bank mortgage. Banks typically are hesitant to lend out money to people who want to act as their own general contractor. So after purchasing the cottage, I quickly began to develop a set of building plans for my lake home. In addition, I visited the local building inspector and asked a lot of questions, such as, how big of a home I could build on the lot, required set backs, and easement concerns. I also chose not to hire an architect as I already had a good idea of what I wanted to build for a home. An idea I had gotten from studying various house plan magazines and looking on the internet. Thus, I chose to develop my own house plans simply using an inexpensive home design software package. I based my home design on plans that I had found in a magazine. However, the specific house plans in the magazine were smaller than the home I wanted to build so I had to re-scale it to the size home I desired using the home design software package I had purchased. Since I was also acting as the general contractor on building my dream home I also developed a detailed schedule for the project. Besides the expected start and complete dates for the overall project, I also included expected start and complete days for all phases of the project. Phases that ranged from razing the old cottage, and excavation and foundation work, to getting the occupancy permit for legally moving into the home. 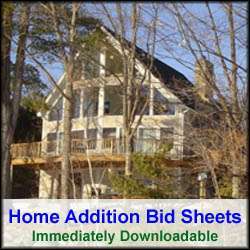 I also identified what subcontractors to use for the construction of the home, and made very accurate estimates for each phase of the project. 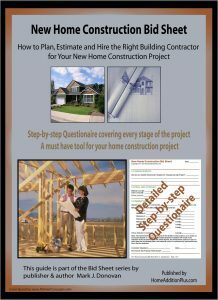 I added estimates that came from subcontractor quotes, to the cost of all the building materials. In addition, I listed out long lead items so that I could order those items or start those tasks early. For example, I knew I would need a new septic design for the home I was building. Having a septic design done requires a licensed designer and approval of the design by the town and state. Thus you need about 12 weeks to get a new septic system designed and approved. Also as part of acting as my own general contractor I had to find and hire subcontractors for the project. Hiring subcontractors can be tough. They are all busy and march to their own drums. Thus, I really needed to interview them and carefully study their quotes to determine which ones were going to be right for my project and personality. One of the smart things I did when it came to hiring subcontractors was to check multiple references for each. Checking references very much helped in culling out some of the sub-contractors I had considered. After I had completed my house plans and had an accurate cost for building my dream home I visited my local building inspector again. This time I came with a checkbook in hand. I sat down with him and he reviewed all of my house plans and cost estimates carefully. He also looked carefully at the position of the home relative to the waterfront, and other boundaries of the property. He actually had a few minor issues with the house plan construction that we addressed on the spot. He then issued me the building permit and I wrote him a check. And with that, I was ready to start construction of my dream home. I was also fortunate in getting the building permit in the fact that my new septic design had not been completed yet. I was fortunate because he issued the building permit due to the fact that the property already had a 2 bedroom septic system on it. Though it was smaller than the number of bedrooms in my house plans, it was sufficient enough for him to grant me the permit. If the septic system had not been there he would have held off issuing me the building permit until I got the state approved septic plans for the property. In Part 2 of “Building Your Dream House”, the actual construction work begins. The old cottage gets torn down, the excavation and foundation work occurs and framing begins. Stay tuned…………….